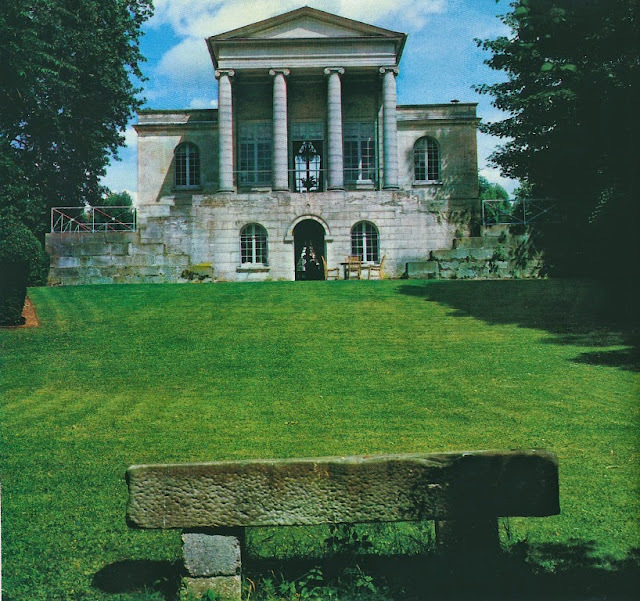 Although built in 1800 for the French military hero, Jean Victor Moreau, Le Temple de la Gloire, a historic house located near Paris, might be better remembered by some as the residence of Oswald and Diana Mosley, a couple who needs no introduction. Conceived as a pavilion for entertaining and relaxation, the rather grand-looking Le Temple de la Gloire is deceiving, consisting mainly of a central block comprised of a drawing room and a dining room beneath it. 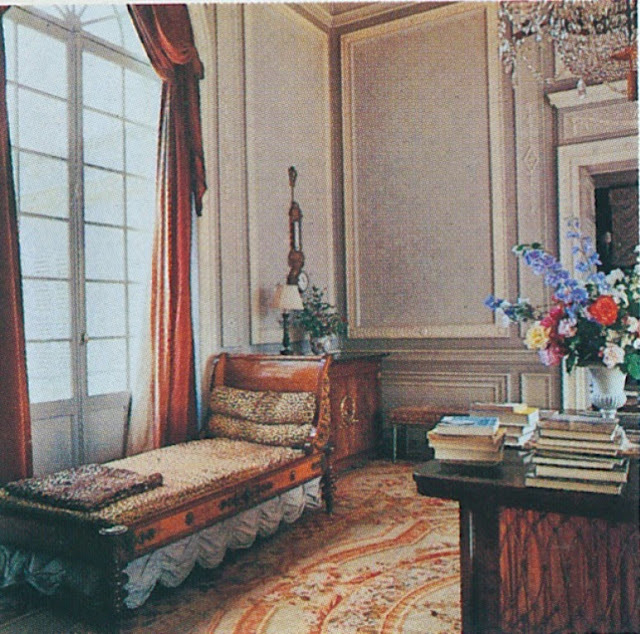 Located on either side of the drawing room are two small rooms, each with its own tiny bedroom. As imposing looking as the structure's façade might be, behind it is a house that could be described as compact. I first found photos of Le Temple de la Gloire in the 2000 book, The Finest Houses Of Paris , which clearly stated that the pavilion then belonged to Diana Mitford Mosley and her late husband, Oswald. (I featured these photos on my blog back in 2013.) 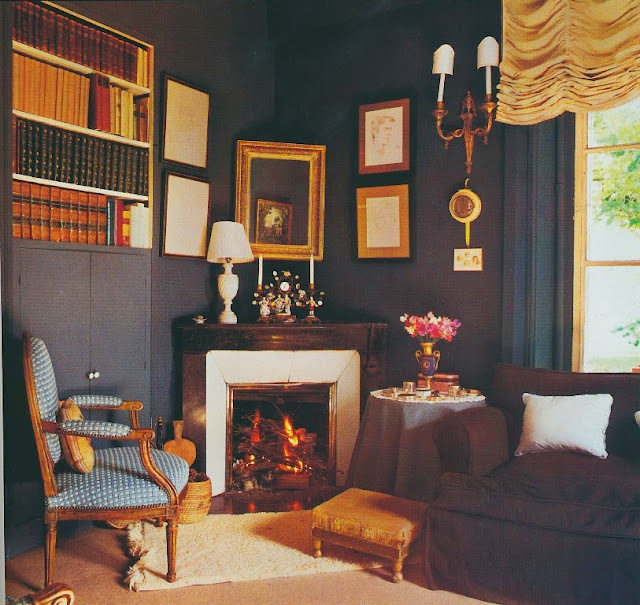 Recently, I found additional interior photos in a 1981 issue of Architectural Digest, although curiously lacking in the magazine article is any mention of the Mosleys. Instead, the residence is referred to as "the house of an Englishman." Did the Mosleys prefer anonymity in hopes of avoiding controversy? Then again, the Mosleys were ones who seemed to court controversy throughout their adult lives, so perhaps the absence of names was a decision made by the magazine. Whatever the reason may be, the article provides us with additional photos of this glorious architectural gem. The drawing room, which was furnished with an Empire chandelier and a daybed that was made for French actor, François Joseph Talma. 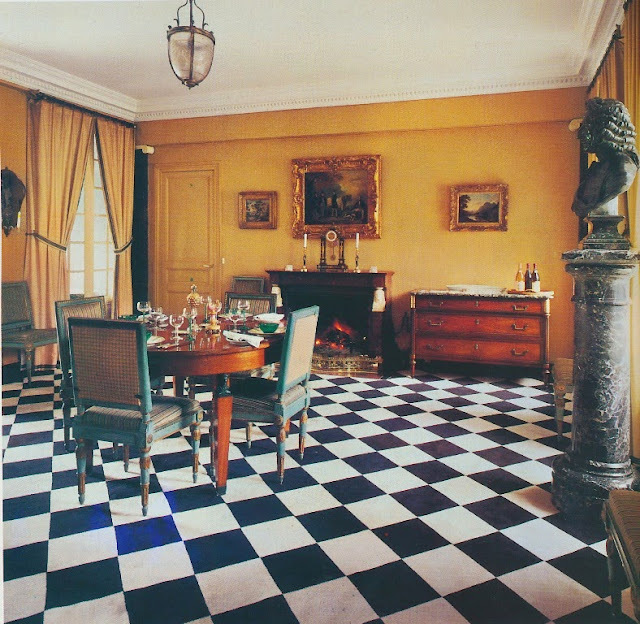 One of the more striking decorations in the pavilion's dining room is the black and white checkerboard carpeting. The dining table is Empire, while the dining chairs are Louis XVI. 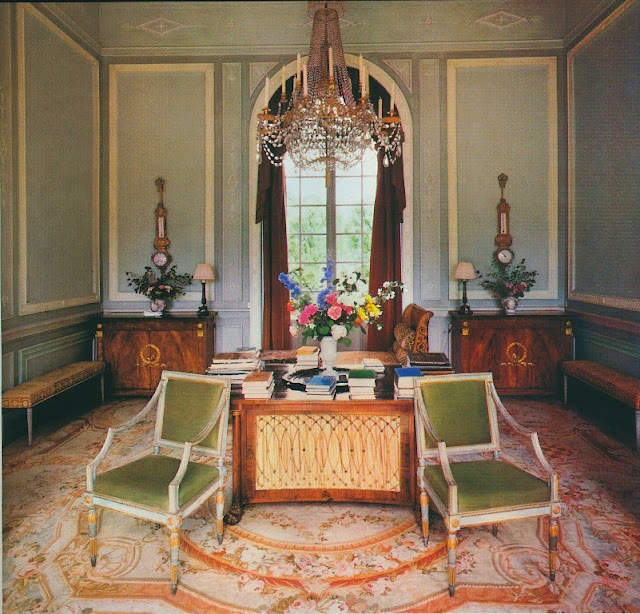 A small sitting room, which is located to one side of the drawing room. 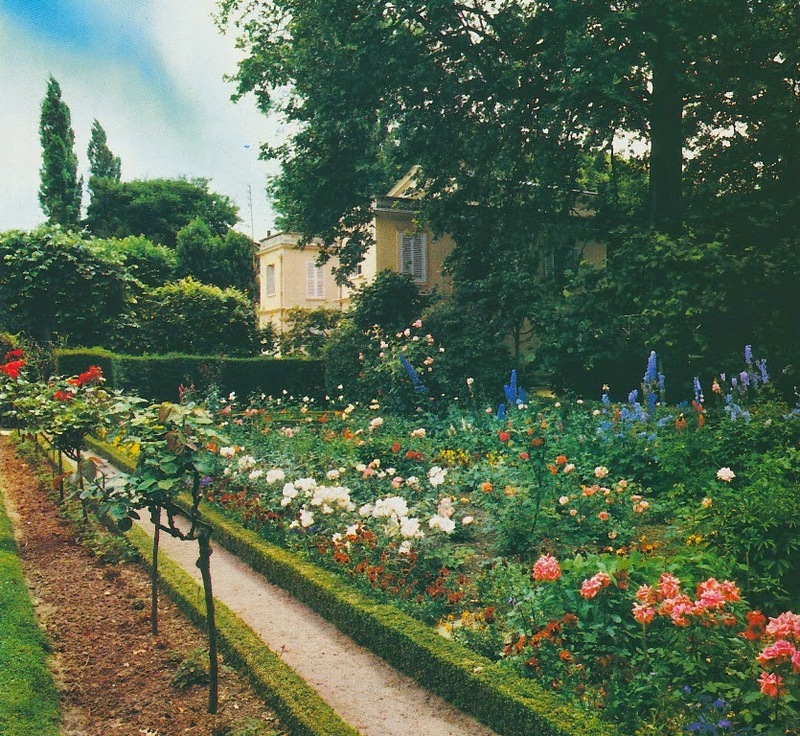 The flower garden, which was based on the original 1800 plan, was planted with cheerful delphinium, pansies, and roses. 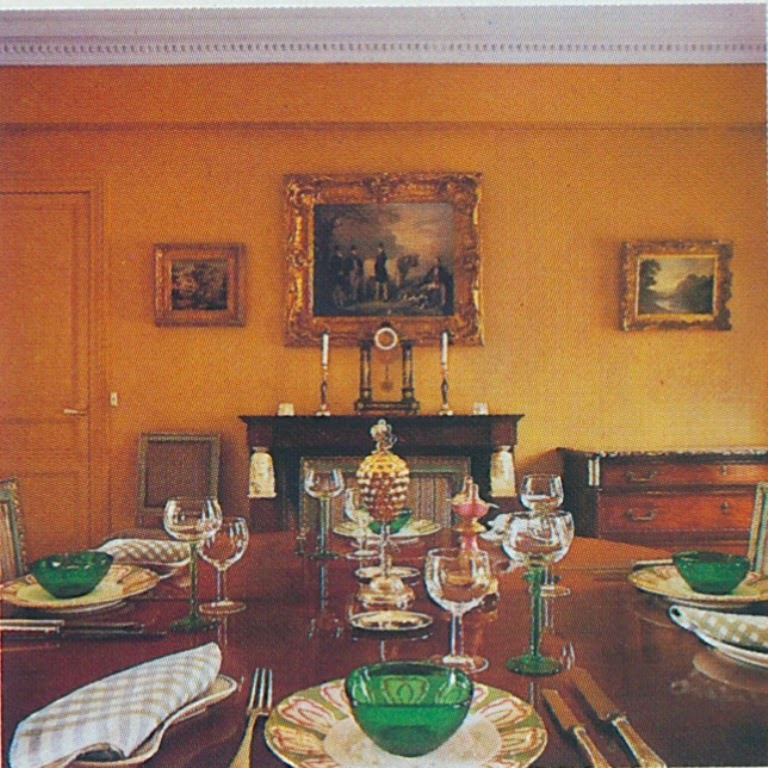 All photos from Architectural Digest, May 1981, Bruno de Hamel photographer. The pavilion is perfect; a gem of architecture. If more small houses had such attention paid to design and planning, the super-sized suburban behemoths would be history. 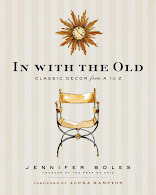 As baby-Boomers age out, we may see a new trend toward such relatively small but stylish homes -grand, yet manageable. I was shocked when WoI published an article about this house and its then owner Diana Mosley so fresh was the memory of her history and her husband's as supporters of Fascism. According to what I read (an English newspaper obituary) Mosley remained an unregenerate anti-semite until the day she died and because of that alone, all other faults and history apart, I felt that the WoI had begun an unofficial exoneration of her and I being old enough to remember her history did not and still do not agree with it. I felt pretty much the same when I was taken to visit the house the Kaiser lived in after he left Germany after the First World War ended. I could not disassociate the place and the furnishings from the taint of ownership. Clearly, the Mosleys lost none of their significant financial resources when inprisoned in the UK during WWII. Both remained dedicated Fascists until the day they died. Diana was a gorgeous woman, even as an old woman, and her granddaughter Daphne Guinness looks much like her. Diana loved Oswald so much she would have done anything for him - it was an obsessive relationship. The Mitford sisters (of which Diana was one), were an eclectic lot to say the least. My favorite was the late Dowager Duchess of Devonshire - Debo. This is, indeed, a lovely dwelling, and one that I have many times thought would be the ideal place to live in Paris...in one's dreams. 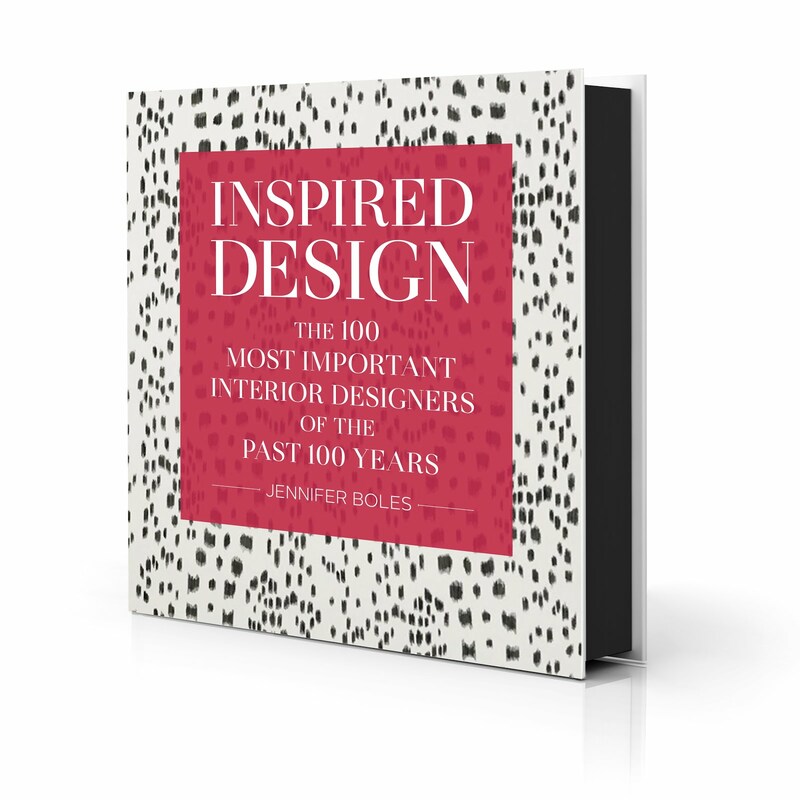 I recall in the WOI story (which I devoured at the time as a Mitford maniac and a fancier of fine buildings and everything Parisian) reading a delicious quote attributed to the Duchess of Windsor when she first saw the house: "Yes, my dear, it is lovely -- but where do you live?" Most amusing and arch, on so many levels. Not surprisingly, given their mutual exiles and shared sympathies, the Mosleys and the Windsors were great friends. Well, sadly,Fascists seem to win the style wars...but fortunately they lost the real wars! One shudders to mention money in connection to the exquisite Lady M, but the Mosleys had dosh and presumably her first marriage to Bryan Guinness must have left her quite comfortably off ?